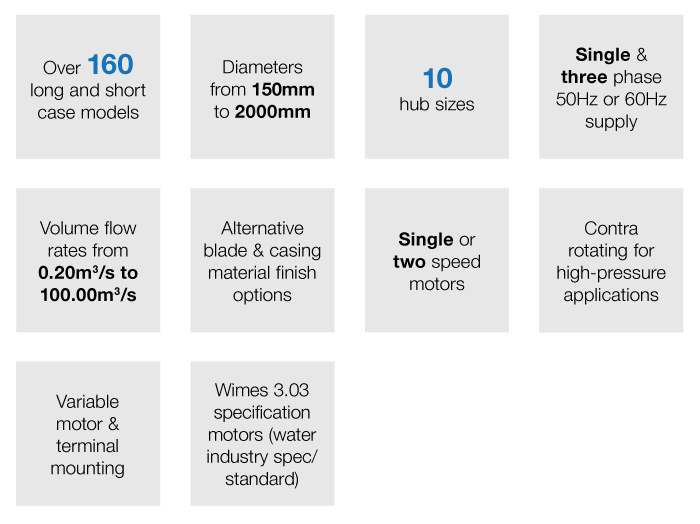 A core product range of our business for over 40 years, today our capabilities and reputation in axial fan manufacturing are renowned in the industry. 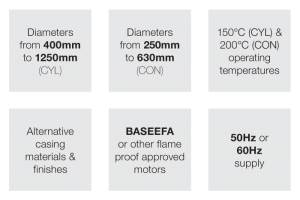 Ranging from a standard unit to ventilate a factory building, to major applications including electrical sub-stations, drying processes and refrigeration, we are able to provide products for a wide array of applications. 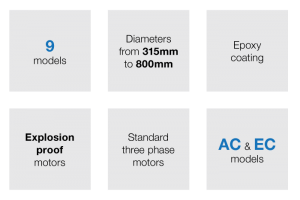 With a diverse range of design and manufacturing options, as well as a complete range of ancillaries and guide vanes to provide more efficient power consumption, our engineers can develop the perfect solution to our customers’ requirements. Manufactured to meet the requirements of the ATEX Directive, IEC standards and EN14986, our comprehensive range of axial fans for hazardous applications carry the proper equipment marking for the region and zone they are designed to operate in. Our ATEX fans are designed and built to the exacting Area, Zone and Category requirements of a given project and utilise components that are certified to ATEX. Additionally, our manufacturing capabilities allow us to meet specific overseas hazardous classifications with a variety of flexible component options. Manufactured internationally across our sites and those of our sister companies in Elta Group, the proven reliability and performance of our axial plate fans, along with their flexible construction options, have made them the preferred choice for a broad range of standard and specialist applications. Each plate is manufactured from mild steel, features the latest in impeller technology and, for a complete package solution, also has a dedicated range of ancillaries and controllers. Elta Fans are able to offer cost effective belt drive fans for when it is essential that the motor be outside the airstream. Products can be designed for safe or hazardous area applications. Fan casings are constructed to meet the most arduous conditions and, as standard, are manufactured from mild steel and then hot dip galvanised to BS EN ISO 1461:2009. Elta Fans’ bifurcated axial fans are direct-driven units that were specially developed for handling hostile air conditions including hot air, gases and corrosive fumes. Manufactured to the highest quality from mild steel and hot-dip galvanised to BS EN ISO 1461:2009, the range is available for standard and high-temperature applications. Our bifurcated range delivers a wide selection of air performances, including higher-pressure models. Our ventilation experts tailor our solutions to suit your needs. Yes, we build our ventilation products just for you. Elta Applied Technologies Asia Pacific is part of the Elta Group of companies. A distinctive competence of our business remains as prevalent today as the day we started in business. We are focused to the individual needs of our customers.